02.what is making this particular map and this particular airport unusual is number of warnings about surrounding environment. don't do this, don't do that, don't fly after 11 p.m., avoid this and avoid that. 03.toronto island is protected area within couple of kilometers from the downtown core, sanctuary for various wildlife, birds, clean beaches and parks. 04.access is only with a ferry boats exclusively for pedestrians and very limited number of vehicles are aloud. 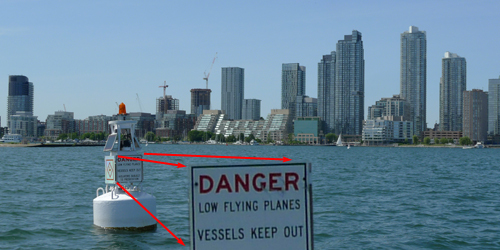 even electric bikes that doesn't look like a pedaled bicycles are not aloud on this boats. but the biggest pollutant is excluded!!!??? 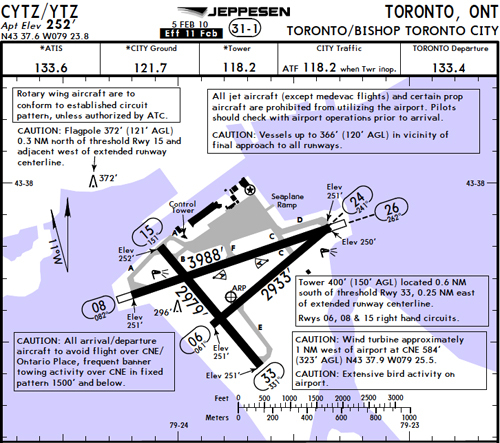 05.airport is owned by the federal government and city of toronto was for ages in "fight" with port authorities managing airport, about permanent bridge, extensions of the runways, more flights, jet plains flying. 06.oposition from the people living and using waterfront about noise and pollution is never properly heard, and having in mind new mayor and his crazy capitalist not city loving politics, without skills to envision urban values, future is not bright. 07.it is the only airport on earth where you can literally walk to it from hundreds of thousands of people living nearby! 08.look at the psychographs #02 . huge airplanes flying day and night, and believe me, I live in the walking distance from it, they are not restricted to "before 11 p.m.", by some great misfortune there are regular delays every night. or delays are somewhere in the heads of those in the federal government, looking only to please "big" business? 09.at this two last photos very obvious is kind of impact to the city life. 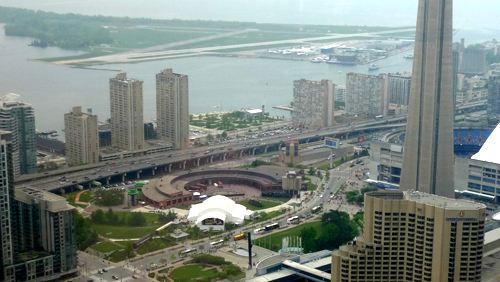 first one was taken from the 55th floor of the dominion centre in the financial district of the city, the second one from the toronto harbur, main crossway for numerous yahts and other lake vessels. DANGER LOW FLYING PLANES! what they are suppose to do, turn to submarines maybe? 10.what to do? well keep complaining, one day we might be heard.